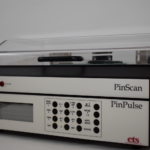 Model 9910 PinScan Automated ESD Test System - Electro-Tech Systems, Inc. 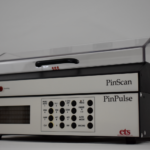 The Model 9910 PinPulse™/PinScan™ is used to determine the ESD susceptibility level of electronic devices up to ±8kV. PinPulse generates ESD pulses up to ±8kV for testing electronic devices for susceptibility to Electrostatic Discharge (ESD) using HBM, MM and HMM models. 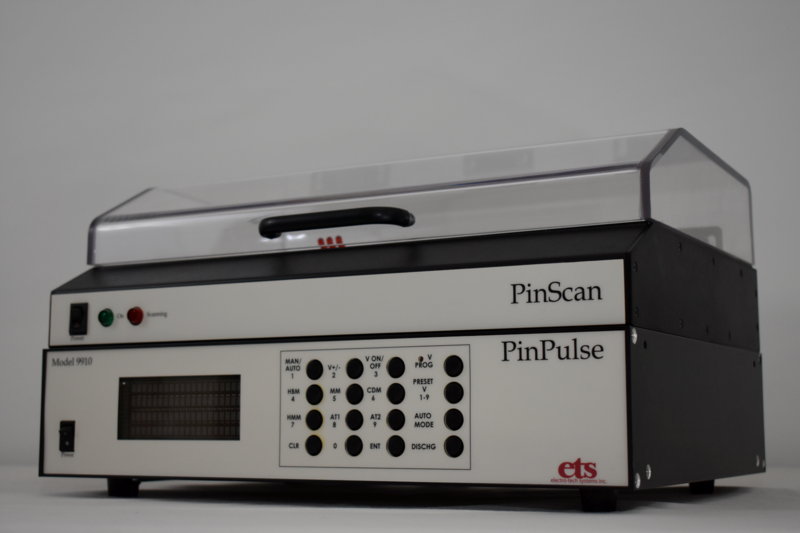 PinScan provides automatic sequencing of ESD testing of up to 128 pin devices, applying a discharge, then performing a curve-trace test to identify a failure. 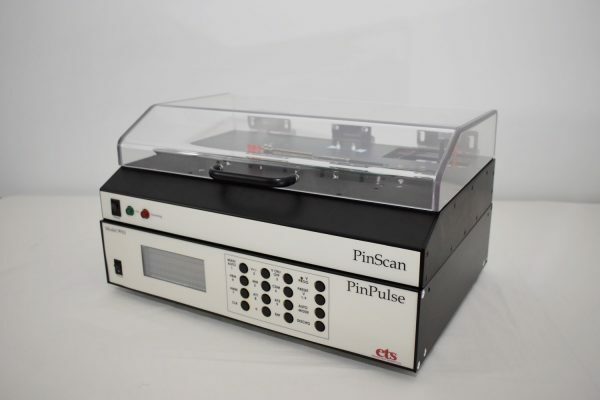 The PinPulse technology provides reliable high quality, low parasitic HBM, MM, and HMM discharges utilizing a 2-pin test method to determine the susceptibility level of electronic devices from ±5V to ±8kV. Proprietary ETS technology utilizing specialized relays creates support Human Body Model (HBM), Machine Model (MM) and Human Metal Model (HMM) all in a single unit without any need for additional modules/options. 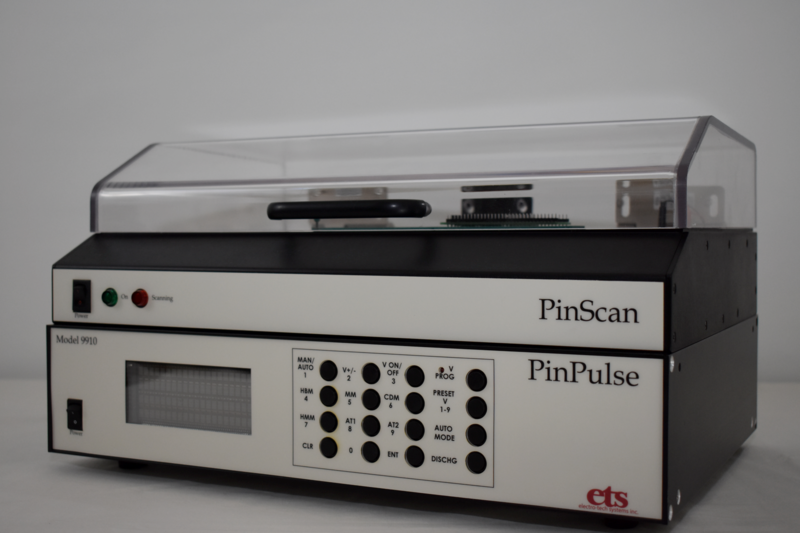 PinScan builds on the foundation of the PinPulse system, adding fully automated sequencing of discharge operations, and adds the capability to perform a curve-trace test before or after stressing the Device Under Test (DUT). The software-based platform provides a user-friendly interface which provides control of the pin locations, voltages, timing, and curve-trace testing. A proprietary switching system provides automated connection to the DUT pins. The PurePulse discharge can be applied between any two pins of the DUT. The testing sequence can be run with no user oversight. 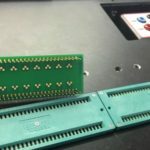 PinScan connects with the DUT via a 128-pin interface that enables automated connection to the device pins. 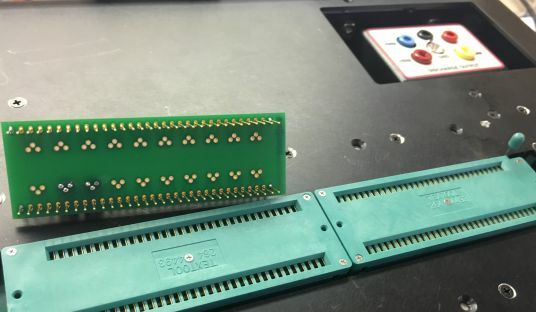 A family of adapters allows direct plug-in of any desired collection of DUTs, from 2-pin devices to higher pin-count ICs to completed assemblies. A standard adapter board is included with the system and additional configurations are available from ETS. PinScan includes the additional feature of testing the circuit during the test. A current vs. voltage plot is provided which clearly shows any change to the condition of the device. A locking cover is included to provided interlocked safety enclose for the DUTs and test connections during testing. PurePulse utilizes proprietary ETS technology to provide clean waveforms with selectable peak Voltage from ±5V to ±8KV. PinScan enables automated hands-free 2-pin testing of devices up to 128-pins. Curve tracing (Current vs. Voltage) functionality provides real-time device evaluation before and after discharge.